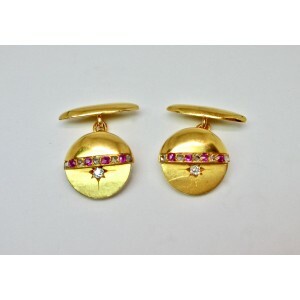 Cufflinks in 18 carat gold set with alternating rose cut diamonds, rubies and two small old cut diamonds in a star setting, typical of the mid 19th century. Hexagonal cufflinks set in gold and platinum with calibrated sapphires, rose cut diamonds and old cut diamonds. From the Deco’ period 1930’s circa. 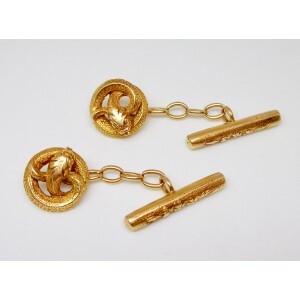 Set of cufflinks and buttons for tuxedo or tailcoat, in gold with enamel. Probably Russian, start of the twentieth century. Classic Cartier cufflinks in 18 carat gold, signed and numbered. Excellent condition. 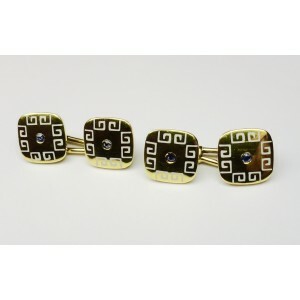 Cufflinks in 18KT gold with button design made with mother of pearl and surrounded by blue enamel design. 1930's circa. 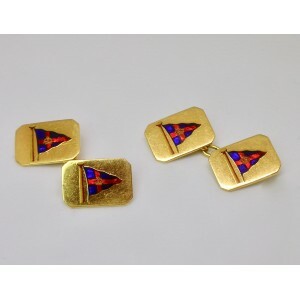 Nautical cufflinks in 18KT gold with polychrome enamels, signed Benzie of Cowes (Isle of White), probably from the 1940s circa, with the Royal Southern Yacht Club flag. Cufflinks in gold and platinum of geometric design, composed of rose cut diamonds and sapphires, 1940s. Cufflinks in platinum and gold with calibrated sapphires, old cut diamonds and rose cut diamonds from the Deco' period, 1930s circa. 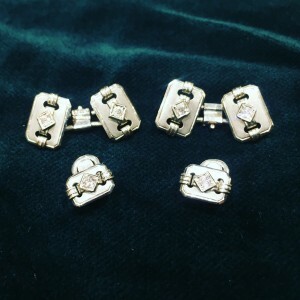 Deco cufflinks set with two buttons in white gold and diamonds, finely hand crafted from the beginning of the 20th Century. 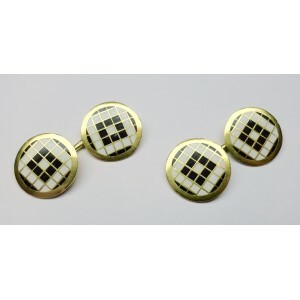 Deco period cufflinks in 18KT gold with very unusual enamel decorations which resemble a chess board. The enamels are in excellent conditions, item from the 1930's circa. Cufflinks in 18KT gold with old cut diamonds and emeralds, with snake design from the 1930s. 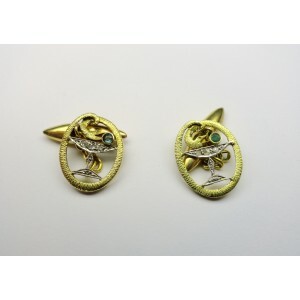 Cufflinks set in 18 carat gold, finely shaped as a snake, probably from the beginning of the 1900s. Cufflinks in 18 carat white gold with satin effect, each with a round cut diamond in the centre, 1970s circa. Total weight 13 gr. 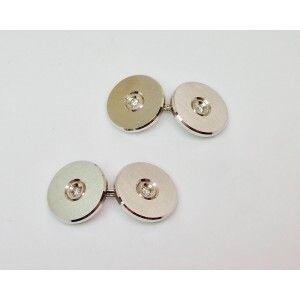 Cufflinks in 9KT gold and platinum with mother of pearl. From the 1930's circa. Square shaped cufflinks in 18KT gold with white enamels of greek inspiration and small sapphires in the center. From the 1940's circa. 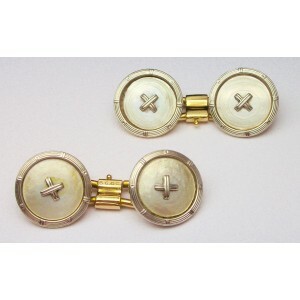 Cufflinks in 18KT gold of Italian provenance and fine manufacture. For a total of 18.3 grams. From the 1940's circa. Cufflinks in 18KT white gold with central onyx piece with floral decorations and small diamond. From the 1980's circa. 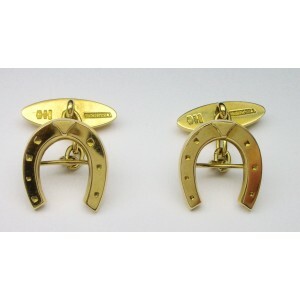 Horseshoe cufflinks in 18KT gold signed by Weingrill, from the 1980's circa, hallmarks show they are Made in Italy.